Terra Forming Terra: Curiosity Has Landed Safely! 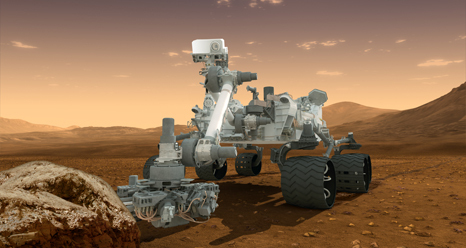 NASA's Curiosity rover has landed on Mars! Its descent-stage retrorockets fired, guiding it to the surface. Nylon cords lowered the rover to the ground in the "sky crane" maneuver. 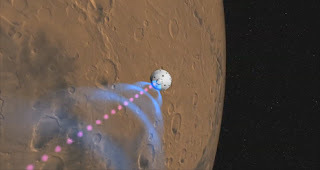 When the spacecraft sensed touchdown, the connecting cords were severed, and the descent stage flew out of the way. The time of day at the landing site is mid-afternoon -- about 3 p.m. local Mars time at Gale Crater. The time at JPL's mission control is about 10:31 p.m. Aug. 5 PDT (early morning EDT). I am now waiting for confirmation that it worked - a few minutes yet! I heard somewhere that the delay would be around 8 minutes and we are at the fifteen minute mark. PASADENA, California (Reuters) - The Mars science rover Curiosity landed on the Martian surface shortly after 10:30 p.m. Pacific time on Sunday (1:30 a.m. EDT Monday/0530 GMT) to begin a two-year mission seeking evidence the Red Planet once hosted ingredients for life, NASA said. "I can't believe this. This is unbelievable," said Allen Chen, the deputy leader of the rover's descent and landing team. The car-sized rover apparently came to rest at its planned destination near the foot of a tall mountain rising from the floor of Gale Crater in Mars' southern hemisphere, mission controllers said. The $2.5 billion Curiosity project, formally called the Mars Science Laboratory, is NASA's first astrobiology mission since the 1970s-era Viking probes.